The ladies call me charming. I thought it was my eyes, or maybe my orange stripes and pink nose. Glogirly says I have a charming personality ...at least when the Boss isn't around. So I got this charming necklace to match all my other charming stuff. It's got a lion, you know...like the really BIG cats in Africa. And it's GOLDEN. Golden HAS to be charming. On the back it has my name, "Waffles," and my phone number too. The ladies will LOVE that! Oh, this is Black Cat and he's just modeling my new necklace. He's not as charming as me, but Glogirly says he does a nice job of sitting still. I tried to eat my necklace, but it didn't taste very charming. So I'm going to stick to eating the Boss'– I mean my food. The Boss says there's nothing charming about me eating her food. 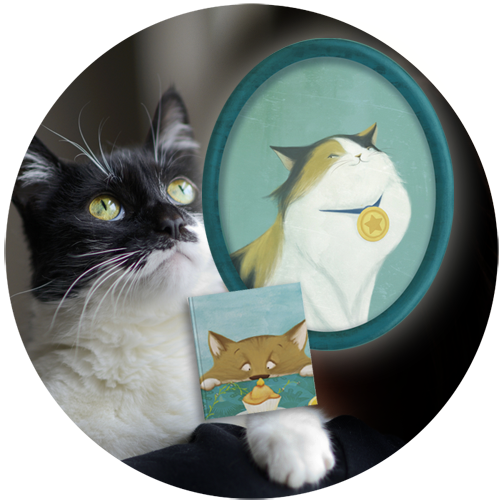 In case you're wondering where I found such a charming necklace, it's from Sleepypod's Jewelry Grade Pendant Collection for Pets & Children. Even though it's supposed to be MINE, I think I saw Glogirly wearing it the other day. That's okay though, because I think she's kind of charming too. Mad Kitty Cocktail Wants YOU! 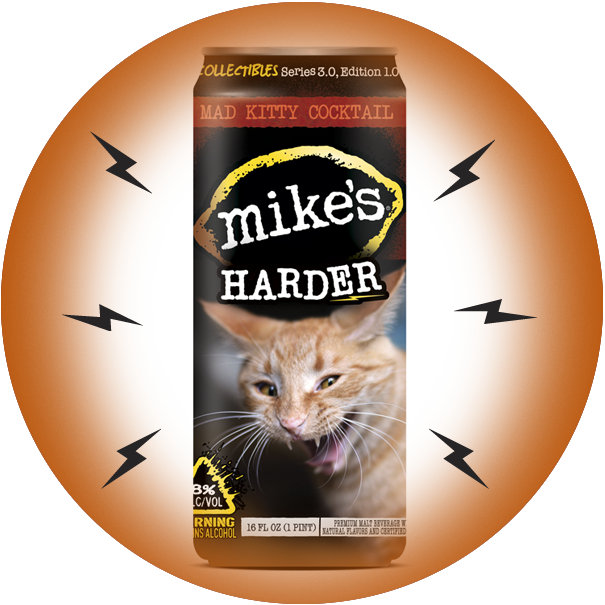 Let's get Waffles' picture on the NEW Mike's Harder Lemonade can! You are very charming Waffles! You do look charming wearing that charm. The ladies are going to LOVE it. Please don't eat it Waffles. Then you will have to go to the v-e-t.
What a pawsome lookin necklace! What a sweet charm, Waffles! And I think it really suits you! Not just charming but angelic! I think it matches your furs great Waffles! Very dashing Waffles...! I mean, charming. My girls wear something similar with their address and information, though they are chipped too. Can't be too careful. That's a great charm, Waffles...very shiny! And it looks good on you. When I first started wearing a necklace, I tried to eat it too. Wow, that sure is a charming necklace Waffles! And it looks wonderful on you! You're charming, the charm is adorable, and we think Katie is wonderful, too. Does that cover all the bases? MOL! Nice bling! I like that charm, a lot. Suits you. 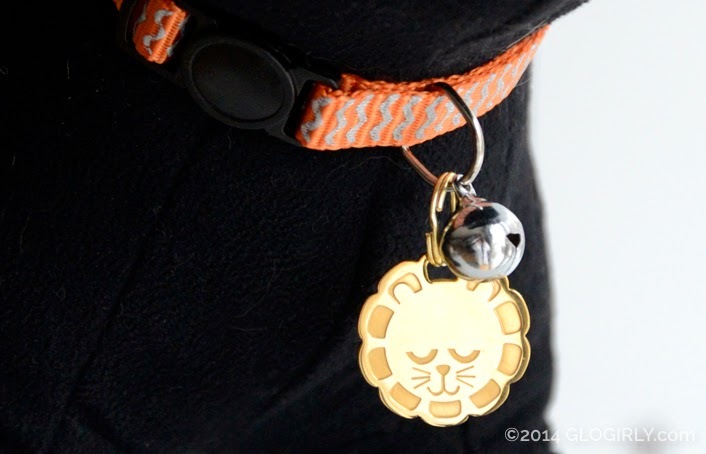 We think all kitties should have charms on their collars! Oh Waffles you are unquestionably charming! And I'm sure the Boss is too...she just can't get a fair shake. And so sweet of you to share your charm with Katie! 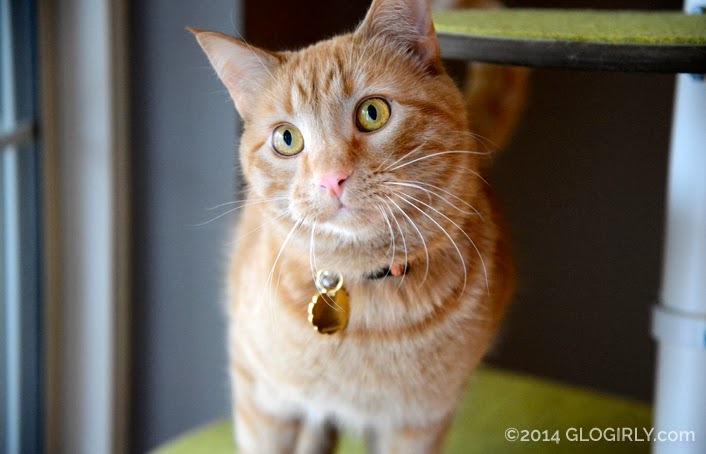 We can see why the ladies think you're charming Waffles! That bling just adds icing to the cake! Waffles you look so adorable! That pendant sends your charm over the edge and back again, buddy. The girls are going to swoon! Charming. That is the PURRfect word to describe you Waffles! You are a very charming kitty, Waffles! :) That collar charm is very dashing on you! Don't ever wear that charm around the ladies, Waffles! Too many faint around your gorgeous self now! You are always purrfection to us! The charm isn't even necessary, but a great compliment to your handsomeness. * sighs * Another I want one of those from Mu. She can't wait to visit Europe, maybe they have some cool cat stuff too! 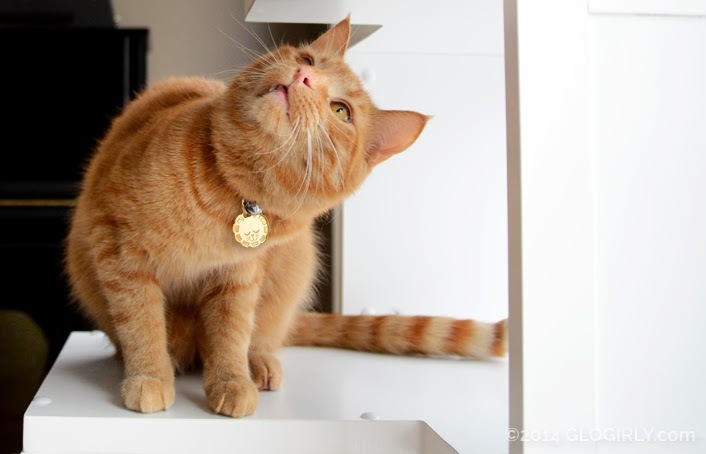 You ARE super-duper charming, Waffles, and your necklace is too! A man should be proud to wear his bling! You are very charming Waffles and look very handsome in your new necklace. No matter how you look at it, you're definitely charming, Waffles! That's a very cute necklace, Waffles. You do seem like quite the charming guy :) I'm sure your mommy just wore your necklace because she needed a little bit of your charm that day. Oh Waffles you are beyond charming!!!! That charm that you and your Mom are (sharing) is just adorable! That is so cute. Waffles you are adorable. Yes, it does look great on you Waffles. We'd agree that Glogirly is charming too. Whoa! Is that real gold? If so, may I, er, borrow it. Heh! I’ll return it someday. That looks furry cool. Derby has a heart with his name on, Ducky never got a charm. Oh mum reminds us we get our rabies charms, but we don't wear them. Wow! That is furry cool! It is nice that yous has a charm on your collar - just in case yous escapes! I think you are very charming Waffles..I wish I had a charming orange kitty like you..I like your lion charm too sweetie..
Nice! I didn't know Sleepypod had a jewelry collection. I'll have to check that out. WOW buddy - that is one cool dingle dangle. M likes it so much she might go over and order on for me and her. Then we'll have a matching set.